GET IN LINE FOR…… QUEUE! A brand new freshers' sketch show. Every day, millions of people around the world join a queue. Here in Britain, we’ll take any opportunity to form an orderly line, whether it be waiting for a ride, a new passport or as a fresher about to be given your first accommodation… queues are filled with wonderful, weird and wacky characters, just waiting to be explored. 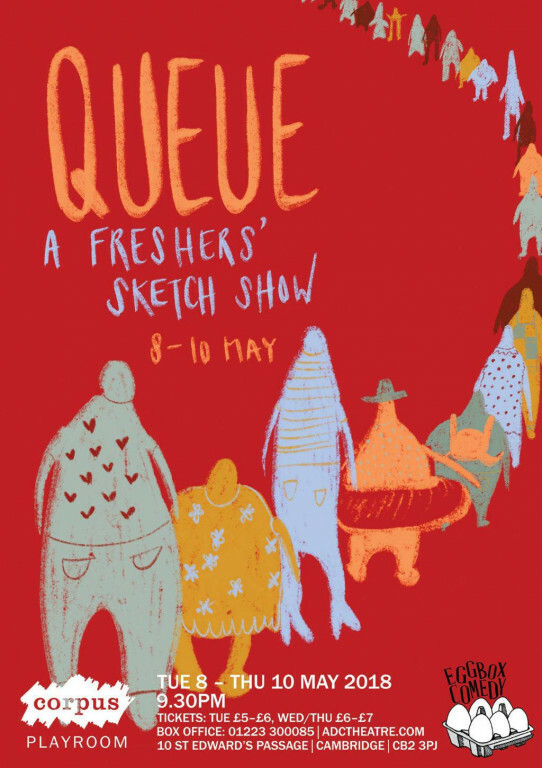 Brought to you by a team of budding fresher comedians, it’s time to join the queue to end all queues! Please stay within the allotted area of the Corpus Playroom at 9.30pm, and wait your turn for a fabulous night of fresh, silly and surreal sketches and character comedy! Cue Queue, where we celebrate the journeys, rather than the destinations and explore one of the funniest concepts in the world and ask burning questions like: seriously, why are 80% of the letters in queue redundant? !